<— You just know from the cover that my eyes popped with reading glee, when I saw it. Dark looking, intriguing, and that title? “Aftermath“. Whoa. This was going to explore some depth, I just knew it. Not just “dark & psychological” (I love those!) but a potential romance of the M/M kind. Two men that survived a kidnapping, forming an emotional bond so deep, that they continue to need each other, after the fact. We’ve heard about this kind of thing before. Maybe not Stockholm Syndrome, but certainly… right up my alley! Maryse’s Book Blog: Who wants to read an M/M book with me? 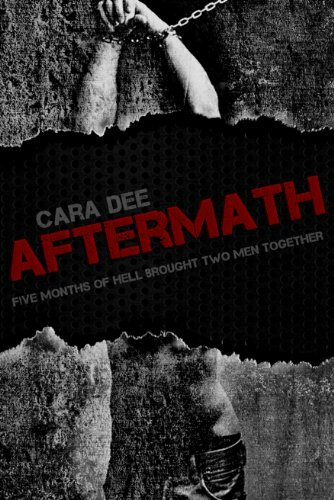 This book has been calling me so hard —> Aftermath by Cara Dee (two men survive a a five-month long kidnapping together- eeeeep!! Definitely up my alley!). I’m starting it tonight!! I can’t wait, I’ve been craving this one for days and the feedback from our fellow readers that jumped on it over the last week or so has me even more excited. Tracie: Maryse you will love this book. It’s absolutely fantastic. Dawn: Read it the other night! It was very good! Kandace: It is so good. You will love them. I loved how separate they were broken but together they were something amazing. Gun or no gun!! Pam: Such a good read. It was one of my first m/m. Very well written. Worth the read! Kathy: I’m in too! It sounds soooooooo gooood! Rebecca: Ooooh Maryse, Dark read and m/m, you will be in heaven!! Maura: Was a great read, not as dark as I expected. Loved Cam and his moody, brooding self but he had a very tender side when he was there for Austin and vice versa. They helped each other heal and found love. Danicka: @40% really liking this! Danicka: It was great! Can’t wait to read your review!! How did you simply leave a five-month long kidnapping behind you? And that is the question, right there. That is a HUGE part of this story. Coming to grips. Surviving “life” after surviving horror. Not as dark as I expected, but only because we start the book in a way where we’re (er… I mean THEY’RE) already free, and we backtrack throughout the book, via their memories. It’s part of the healing process. Also part of their nightmares. And believe me, even though we have that *slight* comfort of re-living through memories only, what they experienced was horrific and scary. A group of various men (all strangers) are kidnapped, and held hostage for five months. Paired up in cells, they are subjected to mental and physical torture. Our two main characters were paired in their cell together. One, a married man/business professional, and the other, of the more “bad boy” lifestyle. But in this cell, all that matters is survival, and the will to live. The hope of escape. And eventually, the need for comfort. This is the exploration of that horror story, the discovery (why did this happen? )… and the aftermath. How these drastically changed men attempt to re-integrate themselves into their old lives. And what they still need, to cope. Each other. Another reason Austin couldn’t sleep was his odd need to check in with Cam – the man he’d been thrown into a cage-like cell with all those months ago. After spending most of their time together, they’d formed a bond he didn’t understand, but it was there nonetheless. In fact, it felt wrong not to see him everyday now. However, despite my heightened-adrenaline expectations, it wasn’t as gut-wrenching, or heart-fluttering as some of the past M/M’s that I’ve become attached to. Admittedly, I’m fairly new to the genre, so I’ve got a lot to learn. But one thing that keeps me so hooked is the “gay for you” aspect, that absolutely changes the character’s lives. That doubt, denial and the moments of heartbreak. Acceptance. Rejection. And it’s through all of that angst that I fall head-over-heels in love with them as they do with each other. It almost seems the harder they deny themselves, the more intense their feelings become. And mine always follow suit. I’m really addicted to that overwhelming desire, need, emotional want, that just can’t be denied, but with that side of hesitancy. Perhaps, had the book been a bit longer, we could have experienced the initial bonding, hesitancy, and confusion, in more detail. The road to “them” could have been drawn out a bit more. But in this case, the bond was already there. So I’ve come to the conclusion that while this is about the romance, it was just as much about their healing. That said, I connected and swooned plenty. It had just enough of everything to have me (and mostly keep me) feeling it. Smiling at times, hurting at others. Plus, we got answers! And with those answers, I found out that there’s another book on the way. I’m in for more. Maryse, you are spot on with your review, I too felt the same. Actually I havent finished it. There are others that I love, I am a HUGE cut and run fan, that being my first mm book. Right now I am listening to Rough Canvas and OMG, you have got to get to this one, it has everything. You will love it. I am still open for more suggestions, I like the gut wrenching ones. Thank you for your reviews. I was just SO intrigued by this one’s dark potential. And actually getting to explore the aftermath of such a bond. Yep… this one was just calling me too hard. I couldn’t help myself. You guys are killing me in anticipation!!! I bought it and it’s literally #3 on my TBR, but maybe I’ll finish the M/F I’m reading now and go right into it, 2nd. Marcie-I have been on a constant M/M roll since Try (my first) next was Double Full, Waiting for Ty, and just started Conquest Series….my goodness…first rock stars and now M/M….All out of my norm and LOVING it 😉 I will try Aftermath….I have to be ready for dark reads. Thanks and hope you enjoyed a nice holiday. Maryse-What’s been ur favorite m/m book so far? I’m looking for a next read. I just finished this and I really liked it. I thought it was sweet. The relationship they had and how they were to each other. Obviously not the whole kidnapping thing and how they met. But well, I liked it. I normally got for angsty and gut wrenching but I am glad I read this.